Ulises Farinas and Erick Freitas signing CLOUDIA & REX! 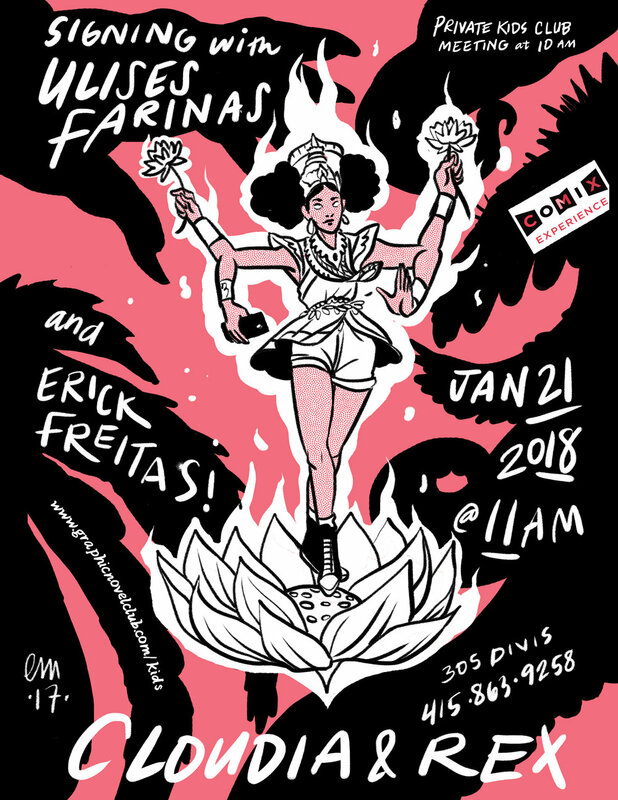 We're thrilled to announce that on January 21st at 11AM, co-writers Ulises Farinas and Erick Freitas will be here at Comix Experience to sign their new all-ages graphic novel, CLOUDIA & REX (Lion Forge)! In this modern-day fantasy, it's up to 12-year-old Cloudia to protect her mom and her little sister Rex when they get caught in the middle of a fight between actual gods. We can't think of a better way to kick off our Graphic Novel of the Month Kids' Club in 2018! As always our Kids' Club Meeting will happen at 10AM, prior to the signing, and will only be open to members. If you're interested in joining in on what promises to be a great conversation and Q&A, check out graphicnovelclub.com/kids now! About CLOUDIA & REX: After losing their dad, 12-year-old Cloudia and her kid sister Rex are taken on a road trip by their mother, who is having a hard time dealing with the stress of sudden single-motherhood. When their car is blasted off the road by a strange bolt from the sky, the kids find themselves with strange abilities—Cloudia has super strength and Rex is . . . a woolly rhino. It seems they've been possessed by two twin gods, Thanatos and Hypnos, who are fleeing the god-realm which is being overtaken by The High Waveform, a single consuming entity. Their mission is to use the girls to ferry the remaining fleeing gods to the World Tree, where a new realm of gods can be reborn. It's all a lot for a 12 year old to fully appreciate until the weight of the responsibility catches up with her. Saladin Ahmed signing BLACK BOLT! Ladies Night Presents: GALENTINE'S DAY!